The above painting by 15th century Italian Renaissance painter Andrea Mantegna is an early depiction of vivid, even ugly, detailed and descriptive realism in the portrayal of the shepherds as they come to adore the Christ Child. I like how they both seem to be in motion. One seems to have just taken off his hat, the other just in the process of setting his elbows down and his palms together and both with their legs half way down to kneel. Whereas all else (Mary, Jesus, etc) are static, the shepherds capture the eye with their movement. Mantegna was an early master of realist description in painting. Then in the Netherlandish painter, Hugo van der Goes, painted the Portinari Altarpiece, one of the most extravagant, vibrant and influential depictions of the Nativity. Van der Goes portrays the shepherds in a similarly realistic style to Andrea Mantegna. Notice how their faces are rugged and un-idealised like those in Mantegna and they are similarly in motion, although not in such stark contrast to the poses around them as they were in Mantegna. There is a more general sense of lavish movement, rich colour and involvement in the scene in van der Goes. Another thing I notice is the individualism of the shepherds in van der Goes’s Portinari Altarpiece: look at how the front shepherd has a serene expression as his palms meet in fervour; how the man in green and red holds his hands out in a state of ‘beholding’, almost as if he would pick up the child, emphasising his smallness and yet his significance at the same time. Then my personal favourite is the shepherd behind them, craning his neck with his hat humbly to his chest, a simple curiosity on his beautifully realistic face. Francesco Sassetti, director of the Medici bank, commissioned the Florentine painter Domenico Ghirlandaio to decorate a chapel. Ghirlandaio, one of whose apprentices was Michaelangelo, was highly influenced by the work of Hugo van der Goes. In fact, Ghirlandaio is responsible for bringing the Portinari Altarpiece (an extract of which is seen above) to Florence, where it remains today. Ghirlandaio’s interpretation of the Adoration of the Shepherds, housed in the Sassetti Chapel, clearly shows the Flemish influence of van der Goes, with the interaction and realism of the shepherds. Although notice that one of the shepherds actually carries a lamb here. Of course, this isn’t just a touch of characterisation (although I think it’s that as well); here Ghirlandaio crosses the symbolism of the Christ Child, who is so often figured as a lamb, but also as a shepherd of the Christian flock, into the humble actual shepherd pictured here. That, coupled with the pointing of the shepherd out front (who I have heard is a self-portrait of Ghirlandaio) combine to create a sense that the shepherds truly are participants in this holy occasion, that they are truly connected to the child. 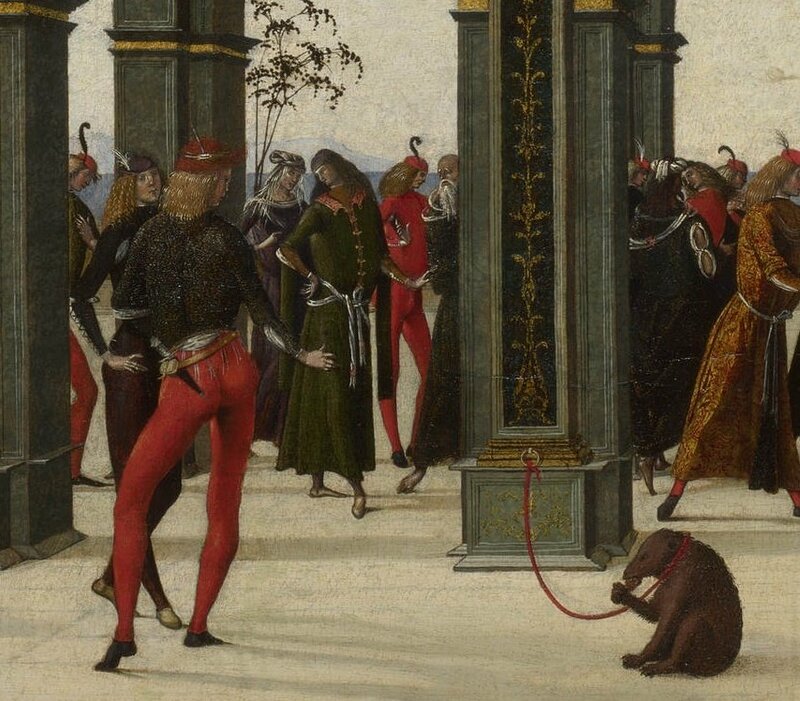 I feel like there is less emotive power and astonishment in the shepherds in Ghirlandaio than there was in the van der Goes; a greater sense of poise and symbolism but perhaps less pathos. Perhaps as time goes on we lose the rusticity and ‘ugliness’ of the shepherds somewhat (although it is certainly still there to an extent). I’ve also noticed that in the earlier Italian Mantegna painting, the shepherds are specifically moving as running uphill towards the child. In the van der Goes they keep some distance, enhanced by the rays emanating from the child – he is the most startlingly holy of the three baby Jesuses, I think. In the Ghirlandaio, there is the least space between the shepherds and the baby. They are right beside him, crammed tightly close like in the Mantegna, but unlike in the Mantegna they are on a level with the child, if you look at their feet. Just some thoughts, but it’s interesting to me how as the fifteenth century progresses, the rusticity of the shepherds appears to decrease and they become more and more stylised in their meanings (the symbolism and the fact that it maybe a self-portrait in Ghirlandaio, as opposed to the torn trousers and anxious movement of the Mantegna). I think my personal favourite is the attention to detail in the van der Goes. Perhaps it is more in keeping with the Northern Renaissance style to vividly display both piety and individuality in one richly coloured moment. Certainly Ghirlandaio saw something special about the van der Goes altarpiece.